Connemara marble bracelet is a women's stretch design. The Connemara marble that is featured in this Irish bracelet is the only natural green marble in the world; fittingly, Connemara marble is only found in Ireland. This Irish bracelet features 6mm Connemara marble beads and this stretch design will accommodate most women's wrists. The Connemara marble bracelet is made in Kilkenny, Ireland by All That Glisters and it is gift boxed with a Connemara marble history card, complements of The Irish Gift House. 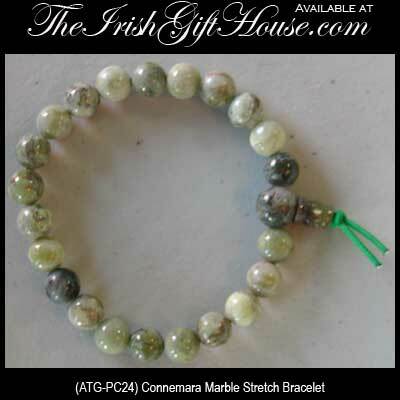 This Connemara marble bracelet, like all the Irish made jewelry at The Irish Gift House, is nickel free and hypoallergenic. Celtic spiral necklace is a silver plated over pewter design that features Connemara marble beads. Celtic necklace features silver plated over pewter construction along with a Connemara marble bead. Celtic necklace features the Dara knot along with Connemara marble beads. Celtic necklace features a Connemara marble bead along with a long slender design. Celtic necklace is enhanced with a Connemara marble bead along with a knot-work charm. Celtic spiral drop earrings are silver plated designs that are enhanced with Connemara marble beads. Celtic knot earrings are studs on posts with a silver plated finish; they feature dangling Connemara marble beads. Connemara marble earrings are enhanced with silver tone metal Celtic knots.